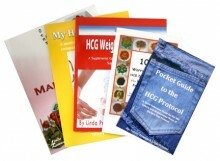 My HCG Tracker by Tiffany Prinster is a simple, but useful HCG workbook for completing the HCG Diet. It is a great companion, especially if you’re completing your first HCG round, with its daily motivational quote and the sense of accomplishment you’ll find from entering in your daily HCG progress. You’ll likely find yourself feeling particularly motivated to stick to the Very Low Calorie Diet (VLCD), just so you can record your HCG successes and look back at all that you’ve achieved. Plus, it will get you in the good habit of recording the foods you eat every day, a routine that also proves very handy in HCG Maintenance. When you track your HCG foods, you have the opportunity to see exactly what foods keep you from losing at your best during the VLCD. Tracking your foods during HCG Maintenance is of utmost importance because it will help you learn exactly how your body reacts to certain foods so you know what foods you can eat freely and what foods you need to limit. This alone can keep you from ever having to perform the dreaded HCG Steak Day in Maintenance. All in all, this book can be a great motivator, instructor, and friend throughout your HCG round.